As you know Wuppie has been suffering from a blood-ear since the winter. When I went to the vet the first time I was told it was to pass on its own and I needn't worry too much, apart from a cauliflower ear he wouldn't suffer any other problems. Of course that's not how it went. So, how did it go? Well, it didn't go away on its own. As a matter of fact, even though the blood seemed to disappear after a while (as did the pus), his ear stayed large and swollen. And even though it looked swollen, it wasn't really. In fact, what had been blood was now connective tissue and had become rock hard! He had had a bit of a droopy head ever since the problems started and that didn't abate at all. I went back to the vet several times after that. The first time back the vet talked about a possible amputation of the ear, but she wanted me to give him some medication first of all. So, home I went with pills and eardrops. Nearly a month later I was back again. A different vet this time, but the same situation with Wuppie. He showed me a bit more about what was what and what to expect if I were to have his ear amputated (a massive vet bill being one of those!). He looked into his ear with one of those look-in-the-ear thingies and saw there was still an infection inside. He decided more medication was in order, but of a stronger variety than the first batch. Today I went back again. Wuppie's ear was a lot cleaner, the infection was gone and even though his head is still tilted, he was quite happy with the result. And then talk once again got to amputation. 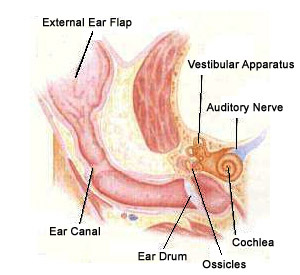 In order to have the ear and connective tissue removed, they would need to remove part of the ear canal (basically the vertical bit of it) as well. Which was already better than the first option: all of the ear canal right up to his ear drum. But I still felt a bit dubious about it. After all, this is a 14-year old cat we're talking about. Besides, the cost of one or two courses of antibiotics a year will be considerably less than a massive operation that wouldn't necessarily end up with the result we want. In the end the decision was made to see how it goes over the next few months. I still have some antibiotic eardrops I am to use three times a week, but if all goes well, his ear will stay on. Looking almost normal! Oh, I hope he gets to keep his ear. I know you'd love him anyway (despite the vet bill) but a fella has to have his pride, right? He's such a lovely two-eared cat. Well I am certainly glad that things have improved. I would continue with the drugs for now. Even thought Wuppie is 14 I do know that cats can live pretty long. If your kitty is comfortable that is what's important. I'm glad Wuppie is happier now that the infection has cleared up! Poor little kitty. Did I ever mention that Emmy's favorite animal is a cat? She is begging me to get one! That operation doesn't seem too nice. If it's better and he feels better, than leave it like it is. He is too old for an ear amputation, poor thing. Sometimes we shouldn't insist to much to keep our darlings ! I think you took the right decision ! I am back from Tunisia and into the cold ! Oh such a difficult decision. I think Gattina's advice is good. Thinking of you. Do let us know of any significant changes.